...Scale Down, Windsor: Real Estate Horror Story or Cultural Opportunity? Real Estate Horror Story or Cultural Opportunity? When I was looking to purchase a home in the Olde Walkerville neighbourhood back in 2002, there wasn't one to be found. True, I had a very specific criteria that I wanted met, which narrowed my focus to about two streets, but the point is - there was nothing for sale. Nada. The minute a "For Sale" sign went up in front of a home, there was dozens upon dozens of people going through it that weekend and an inevitable "Sold" sign decorating the front within a week. When my home went on the market, the first weekend's open house saw 27 families going through the open house, resulting in 6 offers. I was (obviously) the lucky purchaser, but I actually offered MORE than their asking price because I knew the currents of the Walkerville real estate market at the time. So what has changed in the past 5 years? This house, which is almost across the street from me has finally sold after being on the market for months. 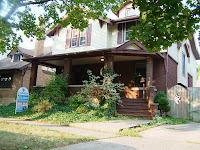 It's a beautiful home - four bedrooms, den, main floor laundry, usable attic space, fully finished (including basement) with all the charm that one could expect in a (almost) 100 year old Walkerville home. When I moved into the neighbourhood, the neighbour who lived there told me he bought the house a few years prior for about $230,000. This made me feel I got a steal on my house. Yet, when he went to sell in '05, he let it go for $210,000. Not so good. Then, just this past week, I find out that after sitting empty for 3 months (the current owners moved to the States) it was taken off the market for a $175,000 offer! Yes, all my neighbours are watching their investments plummet into the same hole Windsor's economy now resides. Yet, our suburban counterparts are enjoying a relatively safe investment. Another neighbour who got a steal on his Walkerville mansion, recently sold his neo-victorian suburban dream house for more than his asking price (over $300,000), so the high-end suburbs are still hot. As D.T.H. stated in the previous post, there are unending opportunities for someone with deep pockets to come into one of these older, walkable neighbourhoods and begin a cultural revolution. The urban influx is happening in countless other communities, which is also signalling their economic health. These cultural pioneers are recognising the importance of being in the thick of things in the core of the city. The never ending opportunities for cultural experiences, the amenities, the (relatively) low current real estate prices and the ability to get on with your life without the need to drive everywhere. So what does this say about Windsor when these incredible neighbourhoods are languishing unloved in the real estate market? It means we still don't get it. It means we haven't made the connection and are still clinging to the unsustainable suburban dream. Posted by Chris Holt at 8:20 a.m.